Are You Thinking About Changing Insurance Companies After Filing Your Claim? One common question many clients have after filing a claim with their insurance company is, “Can I change my insurance company now that I am done filing my claim?” In California, the answer is that question is, “Yes”. 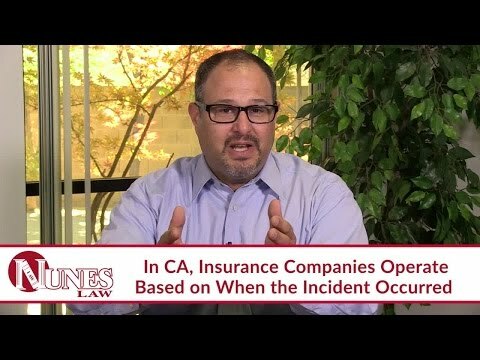 In the State of California, you may file a claim if you had coverage on the date the accident occurred. Your insurance status at the time of the accident is what applies to that accident. In other policies in other states, claims may be handled according to when they were reported. Switching companies after the accident occurs or after you make a claim will not impact your current claim. It simply means any claims for accidents going forward would be with your new insurance company. Watch the video to learn more. If you have additional questions regarding filing a claim or switching insurance companies after you have already done so, I want you to call me at (559) 436-0850. Visit our educational website at https://www.nuneslaw.com for more videos and media content from our law firm.